Poaching is the principal threat to the Siberian tigers’ survival. The animals are killed in retaliation for attacking cattle and as hunting trophies. There is also demand for their skin, bones, and body parts, which are used primarily in Chinese traditional medicine. 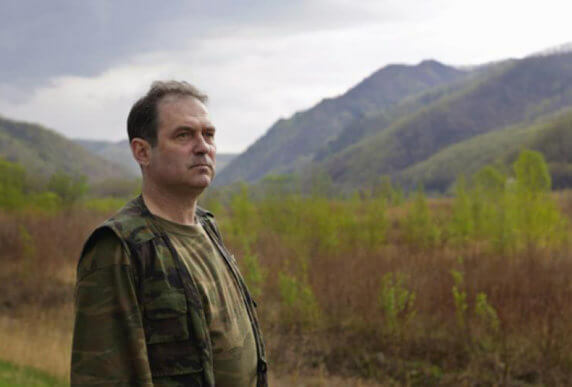 “In the Russian Far East, it’s easier to meet a poacher than a tiger,” quips Sergei Bereznuk, our long-time partner and director of the Valdivostok-based Phoenix Fund. Twelve years ago, Sergei realized that Siberian tigers would be pushed to the brink of extinction if he were to rely on the Russian government to protect them from poaching and habitat destruction. Today, Sergei and his team of six are working tirelessly to ensure the survival of this endangered species over a territory of about 64,000 square miles—much of it pristine taiga forest wilderness. Sergei and his Phoenix Fund use a three-pronged strategy to inspire a new generation of environmental activists to protect the last Siberian tigers in the Russian Far East. They train local anti-poaching brigades and provide them with fuel and spare parts for their patrolling vehicles, among other equipment. This year, Sergei’s anti-poaching work took a major leap forward when the Phoenix Fund started outfitting anti-poaching units with newly-developed GPS software that allows the rangers to better track and hunt down poachers to bring them to justice. 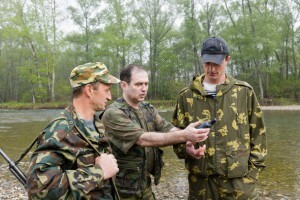 Sergei (center) trains rangers to use handheld GPS devices to track poachers. But Sergei’s efforts to protect the approximately 350–500 wild tigers still roaming the region bordering China and the Sea of Japan go far beyond his efforts to curb poaching. He views the Siberian tiger as a powerful driver for the general conservation of its ecosystem—the taiga forest. As part of their anti-poaching duties, the rangers record information on the state of the forest and the reach of illegal loggers—a huge threat to Russia’s forests. Moreover, Phoenix Fund is one of five participants in Pacific Environment’s groundbreaking black carbon pilot project in Russia. This project seeks to reduce forest fires caused by humans. In addition to destroying thousands of hectares of forest each year, wildfires are a serious threat to the Siberian tiger because they destroy its habitat by turning forest into open meadows and brushwood. Furthermore, they are a significant source of black carbon, which accelerates Arctic ice melt and thus climate change. 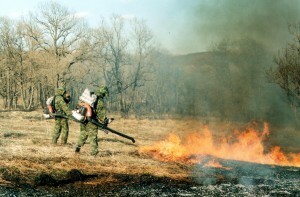 Fire brigades fight wild fires, which eliminate Siberian tiger habitat and contribute to large amounts of black carbon in the Arctic. Phoenix Fund trains and coordinates volunteer fire brigades that prevent and fight forest fires together with park staff in two regional wildlife preserves. Finally, Sergei is a big believer in the power of education. Phoenix Fund works directly with educators and children, and it creates its own educational materials, films, and art competitions. 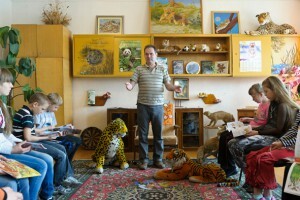 Sergei speaks to a room full of young people about Phoenix Fund’s Tiger Day. Once a year, Phoenix Fund puts on its biggest event, Tiger Day. A powerful motivational tool, it features thousands of tiger-costumed schoolchildren and students and some of Russia’s most prominent environmental activists who parade through Vladivostok’s streets to raise awareness for tiger and forest conservation. As a result of their innovative work, Sergei and the Phoenix Fund have helped stabilize the Siberian tiger population, moving it from Critically Endangered to Endangered on the International Union for Conservation of Nature’s Red List. I’m so very proud that Sergei’s achievements have been recognized with a Rolex Award. Congratulations!